At SC Focus Organization we bring you the second progress report about Star Citizen & Squadron 42. This article is intended to provide our org with information about the current status of both games. Eventually we will release the Star Citizen and Squadron 42 Release Date Estimate pages and this series of reports helps pave the way for our internal progress estimates. Enjoy the intel. For this article completion for Star Citizen & Squardon 42 is scored based on a total of 104 features that were chosen to represent major gameplay milestones for both projects. In the original July 2018 Progress Report we marked total project completion at 14%. In September's results for the new Project Completion page we marked 18%. Star Citizen is roughly 25% complete as of November 2018. This represents an increase of 7% on our previous report in September 2018. In our last report in September, S42 was only 24% (15/62 features) complete by our estimate while in November 2018 after the Alpha 3.3, Alpha 3.3.5 and Alpha 3.3.6 updates the completion shot up to 32% (20/62 features). This represents an 8% increase in just one quarter. Air Shields, Public Transport and the first City have appeared in game. These represent vital S42 features that are now in game. Additionally (although not marked as complete), the multi-tool and drinks / foods props have started to become active in the game. Features related only to Star Citizen, in contrast, only grew by 4% this last quarter. It appears to show that CIG is pushing features for Squadron 42 more aggressively than features exclusively for Star Citizen. The priority seems to be quite clear although the next progress report should help provide more weight to this observation. Progress is speeding up as in the past couple of months the game has started to grow quickly. Just in the last patch Hurston planet was added along with 4 moons. Additionally, the ship pipeline is proving to be greatly accelerated as we have seen, for the first time ever, ships go from unannounced straight to flyable. The Valkyrie and the Arrow by Anvil went directly into playable status. These military ships are required for Squadron 42 and it seems that along with the Kraken (probably used by the rebels in Squadron 42) the focus is on getting the S42 ships out and tested first and foremost. With the Squadron 42 roadmap set to appear in December, it seems likely based on the progress charted that Squadron 42 release date will be sometime between December 2019 and December 2020. Work on the SC FOCUS Squadron 42 and Star Citizen release date estimates will be presented in December 2018 or January 2019 as the data being gathered based on our SC & S42 Features and Release Date Estimates is proving very useful in helping to create accurate prediction models. More to be released soon™. Often a topic of heated debates is how many Star Systems will Star Citizen launch with. Stanton system was chosen as an initial system because it is one of the most difficult systems due to it having several highly densely populated planets and many moons. These four systems are closely connected in the Ark Starmap. Of these four systems Stanton is the only highly complex one featuring heavily populated planets and many moons. This indicates that CIG could easily be in the final phases of at least 4 systems. Though many people have been debating whether Star Citizen will launch with 5 or 10 systems it is very clear that already 4 systems could be close to completion with Stanton being by far the most complex of these 4. Combined with the rapid acceleration seen in producing moons and the creation of a second asteroid field that appeared in Stanton (different and larger than the Yela asteroid field) this indicates that CIG will EASILY be able to produce more star systems within the next two years. Even if Star Citizen were to release in 2020 (most speculators say 2022) it would clearly be plenty of time for CIG to produce more than 10 systems assuming 9 were simpler than Stanton. With CIG polishing the tech required to create planets, moons, clouds, asteroid fields and planetoids it is clear that the ramping up of solar system production is imminent. The 2948 Intergalactic Aerospace Expo featured 80 flyable ships out of 136 concept ships (at the time of writing). This represents a huge milestone as nearly 60% of all ships concepted are now able to be flown by players. 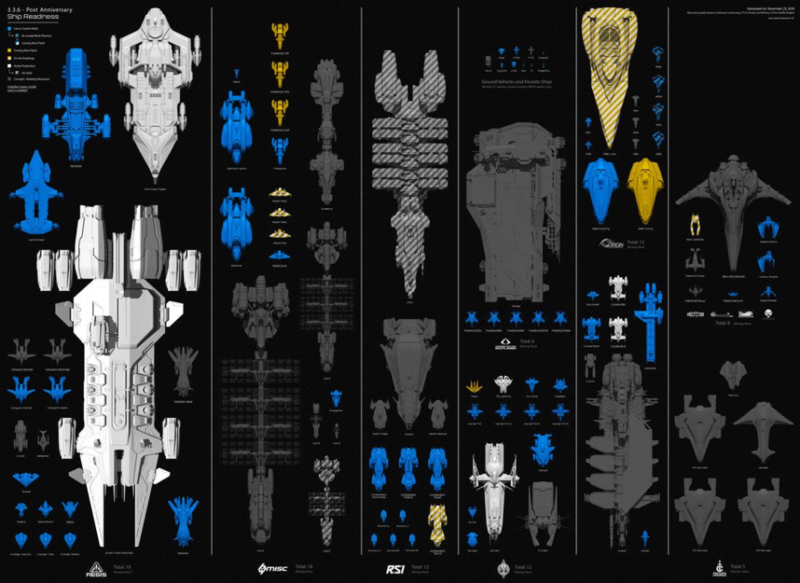 The image created to the right shows the current status of ships in the game (From Reddit). Many more ships will be added so probably the current ship count is about a third to a fifth of the total ships that will be released during the next few years. CIG is getting faster at bringing ships from concept to flight ready. Also the recent Anvil Valkyrie and Arrow went straight to flight ready. Even though SC FOCUS provided a progress report in July 2018 which showed a total progress of 14% it has not been included in this article because the method used to calculate that percentage was very different. For that info please view the July 2018 progress report. As always, this article does not represent the official views of Star Citizen. It is provided as speculation to help SC FOCUS org plan the strategy going forward. This information is provided to readers openly and freely and each reader is free to form their own opinion.